The Eighth Küstendorf International Film and Music Festival will be held on 21-26 January 2015 in Drvengrad in Mokra Gora, Serbia. The festival is organized by Rasta International, under the auspices of the Ministry of Culture and Information of the Republic of Serbia, The Town of Mećavnik and TNSO. As in the previous years, the festival will be dedicated to the future filmmakers and giants of contemporary auteur film. COMPETITION PROGRAMME is comprised of seventeen films coming from the Czech Republic, Slovakia, Island, Romania, Israel, Croatia, Germany, Belgium, France, Hungary, Egypt, Russia, USA and Serbia will compete for the Golden, Silver and Bronze Egg. The variety of authorial approaches and high quality of selected films guarantee that the competition for the awards will be exciting and unpredictable. The international jury comprises Amanda Nevill, the Chief Executive of the British Film Institute, Claudie Ossard, a French film producer and Alex Garcia, a US-based Mexican producer. The Vilko Filač Best Cinematography Award will be handed by István Borbás, a Hungarian-Swedish director of cinematography and Goran Volarević, a Serbian director of cinematography. As in the previous years, the selector for the competition program is Dunja Kusturica. CONTEMPORARY TRENDS is the programme which shows some of the best films from previous year’s production presented by their authors – guests of the festival. After the screening, they will hold workshops. Over six festival days, the following films will be screened: The Postman’s White Nights for which director Andrei Konchalovsky won the Silver Lion in Venice, Roy Andersson’s A Pigeon Sat on a Branch Reflecting on Existence, which won the Golden Lion at the same festival, The Owners by Adilkhan Yerzhanov, Words with Gods, an omnibus comprising short films by Guillermo Arriaga, Héctor Babenco, Álex de la Iglesia, Bahman Ghobadi, Amos Gitai, Emir Kusturica, Mira Nair, Hideo Hakata and Warwick Thornton, and the latest film by Russian filmmaker Nikita Mikhalkov, Sunstroke. NEW AUTHORS is the programme which presents debut feature films that are slowly conquering the film world with their unique film style. This year’s programme is made up of two features and one documentary whose authors already presented their short films at the Küstendorf. Siniša Galić is making a debut with his feature, Open Cage, and so is Gilberto González Penilla, the director of Los Hámsters. Goran Stanković will show his documentary, In the Dark. 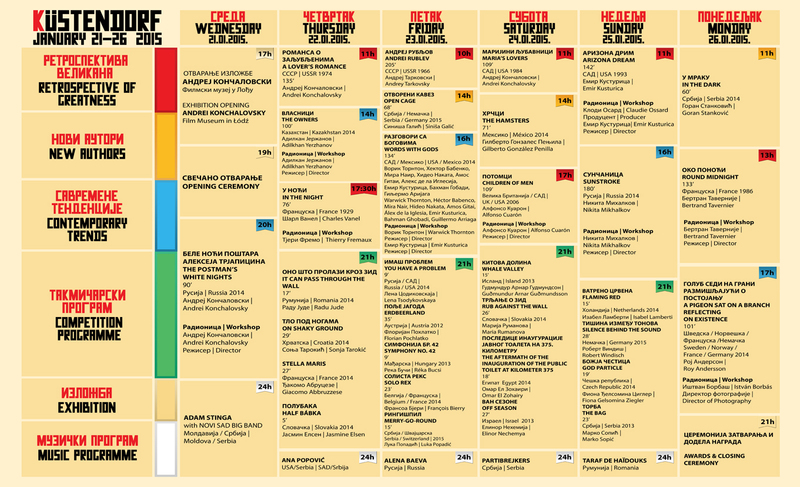 RETROSPECTIVE OF GREATNESS Within this programme, Soviet and US movies by Andrei Konchalovsky will be screened. We will also show films produced by a French producer, Claudie Ossard, as well as those made by Mexican-American director Alfonso Cuarón. Within this programme, the director of the Cannes festival, Thierry Frémaux will present the digitally restored edition of a Charles Vanel film, In the Night. MUSIC PROGRAMME Every night, after the screenings and workshops, concerts by music groups will complete the famed Küstendorf nightlife atmosphere. In this programme we will have Taraf de haidouks, a Romanian orchestra of a dozen, Ana Popović, a Serb blues guitarist who lives and works in Memphis, Alena Baeva, a Russian violinist, Partibrejkers, a Serb rock band as well as Adam Stinga, a Moldovan trumpet virtuoso. The 2015 Küstendorf International Film and Music Festival will host famed authors, actors and musicians, numerous young filmmakers and film students from all over the world as well as other prominent guests from the film world.